… A marketing and branding consultancy that’s been delighting clients since 2008, helping them craft a compelling, engaging and differentiated brand strategy, story, and messaging. … A playground for people who want to create an irresistible brand—the type of brand that generates fan mail, media attention, and loyal customers-for-life. … A place for entrepreneurs and business owners who want to clarify the big pieces — what we do, why we do it, what makes us different, where we’re going, and how to get there. Hello! I’m Maria Ross, the founder of RED SLICE. As a brand strategist, author, speaker, and actress (when I have time!) I believe cash flow and creativity are not mutually exclusive. From dominating my kindergarten classroom to delighting theatre patrons to directing brand strategies, I’ve been entertaining and educating audiences from the moment I could walk. 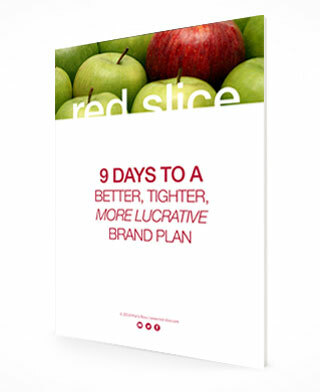 Prior to creating RED SLICE in 2008, I crafted branding and marketing strategies for Silicon Valley start-ups, global software firms, Internet companies, and consumer businesses—including Business Objects (an SAP company), Discovery Networks and Monster.com—and created communication and training strategies for Fortune 1000 clients at Accenture. These days, I ferret out the features that make your company completely irresistible—so you can delight your customers, increase your income, and stand out from the crowd. Branding is all about storytelling. From the logo on your company website, to the 140-character sermon you tweeted earlier this morning, every piece of your brand tells a story. I teach my clients how to tell unforgettable stories—stories that make customers nod, think, laugh, and feel genuinely moved and inspired to take action. I believe that businesses can do good in the world, treat their employees and customers right, and still make plenty of money. I’m on a mission to use my marketing superpowers for good rather than evil! “How do you want to influence the world?”… is one of my all-time favorite questions. Whether you’re a firefighter, a Pilates instructor, or the CEO of a technology company, there’s always a way to create a positive ripple effect in your community—and create a remarkable legacy. You are more powerful and influential than you might realize. In addition to helping my clients create irresistible brands, I’ve been a frequent guest writer for many business and lifestyle publications, such as Entrepreneur.com, The Huffington Post, OPEN Forum, MarketingProfs, Seattle Business, Columbus CEO, IntoWine and Life By Me. My advice and insights have also been featured in outlets such as MSNBC, ABC News, NPR, and Entrepreneur Magazine. I’ve appeared on numerous talk radio shows and podcasts, and have been honored to keynote and delight audiences for the likes of BlogHer, The New York Times Small Business Summit, Urban Campfire, The Chamber of Commerce, Small Business Administration, NAWBO, Women in Consulting, Ladies Who Launch, and Savor the Success, just to name a few. I earned a B.S in Marketing and a minor in Spanish from Indiana University, Bloomington. Among other philanthropic efforts, I’m a brain injury awareness advocate, and I let my dog-fanatic freak-flag fly by supporting the Seattle Animal Shelter Foundation, Best Friends Animal Sanctuary, ASPCA, as well as local Bay Area rescues. Brand strategy is my vocation of choice, but I’m also a theatre and film actress, wine columnist, and author. My popular business book, Branding Basics for Small Business (Norlights Press) is now in its 2nd edition with even more case studies and advice. My Amazon best-selling memoir, Rebooting My Brain, tells the story of my brain aneurysm and near-miraculous recovery—with tongue-in-cheek humor and levity (yes, really). Tough love and straightforward yet nurturing and warm. Collaborative. Decisive. Biased toward action. Practical yet playful. Witty. Wise, Efficient. If you want to spend months (or years) hemming and hawing about a direction, rather than creating a strong strategy and pressing GO, then I’m not your gal. Click here to learn more about what I believe and how I work, so you can see if we’re a good fit. When I’m not working, I’m all about… red wine, beautiful food, Crossfit, hiking, football, trivia, crime dramas, and most of all, quality hug-time with my husband, adorable son, and our precocious Black Lab mutt. Sign up for my email newsletter and get insights and inspiration delivered straight to your inbox. Hire me to speak and delight your audience at your next workshop, conference or strategic team event. Grab one of my books on how to stand out, get noticed, face fears and challenges, and stay inspired. Explore MOMENTUM Pro, my self-study digital program that helps you attract more clients, generate more sales and become a sought-after expert. This is perfect for solopreeurs who are ready to get to the next level, and make smarter, more focused marketing moves that get you results. Book me for a one-day Brand Workshop to align and reignite your team at their next strategic meeting. Prefer to simply contact me and chat? Please do!